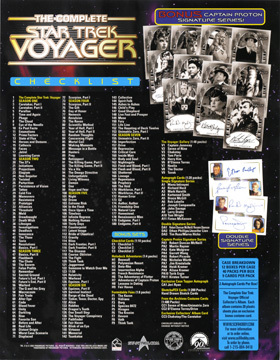 The biggest, most comprehensive set of Star Trek: Voyager cards ever! All 172 Star Trek: Voyager episodes covered in one blockbuster series. At least 1 card for every episode, and that's just the base set. Nearly 1,500 photos in the entire series. 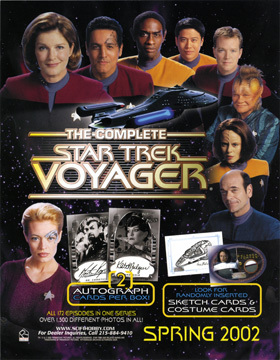 This unique set will also feature three levels of autographs cards; Favorite guest stars, "Captain Proton" and Dual autographs as well as hand drawn sketch cards and costume cards. Chase sets include Adventures in the Holodeck (1:4), Formidable Foes (1:8), Voyager Gallery Cels (1:40), and 15 Hand Drawn SketchaFEX™ Sketch Cards (1:165) by five different artists. Rittenhouse Archives 26 June 2002 10,000 40 8 2½" x 3½"
in "Equinox, pt. I & II"
160 of each drawn except Admiral Paris (210) - Title variations shown with "++"